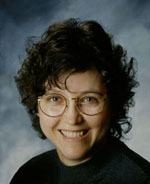 Betsy James is the author and/or illustrator of over a dozen books and stories for adults, young adults, and children. 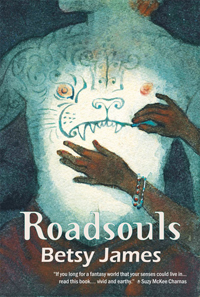 Her latest book, Roadsouls (Aqueduct, 2016), “explores the power of art and creativity for transforming not only one’s own life but also the world one lives in.” You can find Betsy on her websites at ListeningAtTheGate.com and BetsyJames.com, as well as her Amazon author page. What is your elevator pitch for Roadsouls? When readers turn the last page of the book, what do you hope they will take away from it? I am sometimes asked this about short stories, but those have a more limited focus. In the case of a multilayered novel, I really can’t predict readers’ reactions. Different readers will identify with different characters, for different reasons; that’s part of what makes longer writing interesting. The biggest was that the main characters, Raím and Duuni, hated each other at first. They were like those black and white Scotty-dog magnets: pushed together, they leapt apart instantly and as far as they could. It’s hard to further the plot when the protagonists are snarling in opposite corners! Tell us about your main characters, Raím and Duuni. Raím: I have no clue where he came from, but a tall, red-haired, blind weaver has been banging around in my subconscious since I was a teenager. He is a secondary character in an earlier novel, Dark Heart, and wouldn’t shut up until he got his own book. Duuni came stepping out of the shadows to stand as immovable object to his irresistible force. She is up to the task. What was the most rewarding aspect of writing the book? Writing the book. That isn’t a smart aleck answer. No one would stick it out through the monster process of a long, difficult book unless getting it done right, or at least as well as one knows how to, were not at least marginally more rewarding than not doing it. What societies/cultures/history influenced the building of your world in Roadsouls? Three, basically: the European folklore I grew up with; Zuni Pueblo, where I have taught, off and on, for many years; and European gypsy culture in the Thirties, as recounted in Jan Yoors’ book, The Gypsies. Perhaps also my time in Mexico, and hiking the deserts of New Mexico.